During the latter years of the German Empire, these semi-official airmail stamps came into being. 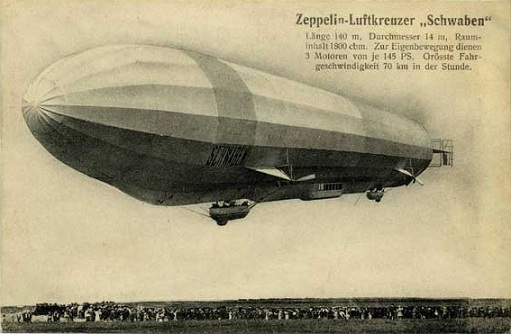 They were printed in June 1912 and were issued for the Rhein und Main airship mail services. These stamps are perforated 11 1/2 and unwatermarked. They come in three denominations and picture a goose carrying a letter. While issued in small quantities, mint hinged examples of these are still readily affordable. 500,000 of the 10 Pf., 200,000 of the 20 Pf., and 100,000 of the 30 Pf. were originally printed. Before 1912, the Germans had developed sophisticated luxury airships, which transported passengers and mail. Airplanes, at this time, were still very experimental and prone to often fatal problems. These stamps paid only the carriage fee for the airship company. Letters carried by, or transferred to, the Imperial postal service still had to have regular postage stamps affixed to them, as well. The 10 Pf. airmail stamp was overprinted "-1 M - Gelber Hund" in dark blue for a special flight on June 10. Only 10,000 of these were produced. The 10 Pf. and 20 Pf. airmail stamps were overprinted "E.EL.P" for a special flight on June 22. 3,000 of the 10 Pf. and 6,000 of the 20 Pf. were produced. 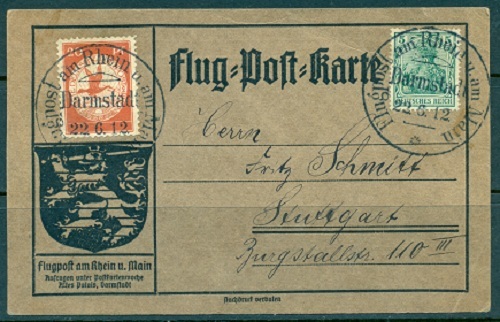 The postcard above, was flown on June 22, 1912 from Darmstadt to Stuttgart on board the Airship Schwaben (LZ-10), only six days before the airship's destruction in an accident. The Airship Schwaben was launched June 26, 1911, and entered passenger service on July 16, 1911. Frequently commanded by Hugo Eckener, the LZ-10 made over 200 flights and carried over 4,300 passengers. The Schwaben was destroyed by a fire and hydrogen explosion at Dusseldorf on June 28, 1912. The Schwaben is depicted in the postcard image below. Schwaben refers to the German name for Swabia, a region and medieval duchy in southwestern Germany that occupied the present-day German states of Baden-Wurttemberg and Bavaria.